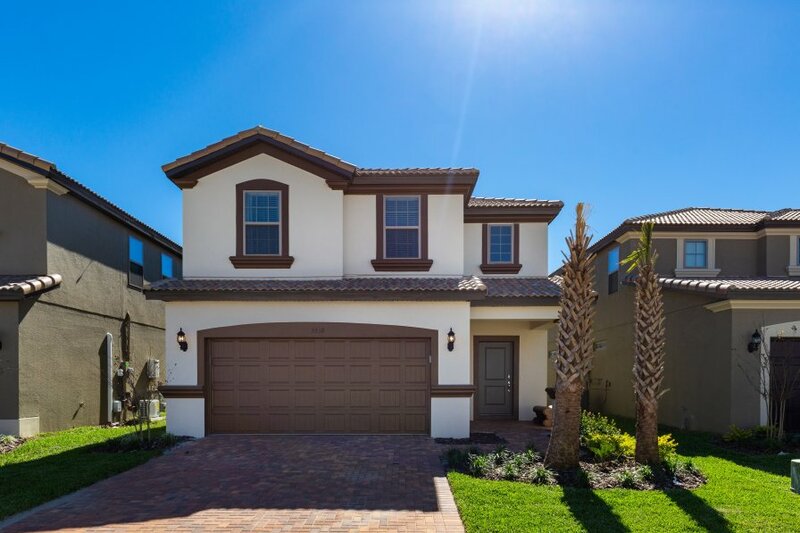 Located in one of the most tranquil areas close to Disney, just 3 minutes from Champions Gate (restaurants, shops, Publix supermarket etc) and easy access to the I4 for routes to the theme parks and both East and West Coast beaches. This brand-new luxury villa has considered everything to make your vacation home magical. Our beautiful open plan home is both stunning and spacious with a fabulous modern interior throughout, it offers you and your guests’ space, comfort and luxury. The Ground Floor Living Room has a cosy inviting setting with comfortable seating for all your guests to enjoy and with views out to the lanai and pool area it’s a great place to gather and enjoy a movie or watch a ball game at the end of a busy day. The Kitchen has lots of natural light coming from the open staircase and is fully equipped to cater for all your needs. Enjoy a quick breakfast or lunch sat at the kitchen island. This is a great space to chat to your guests while preparing the evening meal. Positioned closely to the Dining Area, the layout makes for cooking to be a more social event. The Indoor Dining Area with seating for 8 guests is a lovely place to sample some home cooking and enjoy catching up with the family and unwinding with a glass of wine. The Outdoor Space – features a South Facing block paved pool deck without a property backing on to your deck, providing a feel of space and of course better sunsets! The dining table also has seating for 8 guests, plus plenty of sun loungers so you and your party really can make the most of the Florida sunshine, enjoying food, catching up over a drink or watching the kids splash in the pool. Or of course, enjoying a cold beer in the Spa. The Garage has been converted into a games area with Basketball, Pool and Air Hockey as well as a games table to sit and play cards or board games. It is a great place to let off a little steam and keep the children and adults entertained too. Bedroom One - (downstairs) this King-sized master suite, with its grey, cream and brown interiors is the perfect place to retreat for a peaceful night’s sleep. The room has a flat screen TV and an en-suite with a bath, walk-in shower and double vanity sink, you have direct access onto the pool deck from here. Bedroom Two – (upstairs) another King-sized master suite. At the front of the home, this room is simply gorgeous with a fabulous bed and plenty of natural light. This room has both luxury and style and will make you feel truly pampered. The room has a flat screen TV and en-suite bathroom with a walk-in shower and double vanity sink. Bedroom Three – (upstairs) this King-sized bedroom with wooden furnishings and yellow/white décor has a fresh and sunny feel. The room has a flat screen TV. Bathroom facilities are shared with bedroom four and feature a bath with shower and double vanity sink. Bedroom Four – (upstairs) another great bedroom with king-sized bed, it has navy and white furnishings, this is the perfect place to relax. It features a flat screen TV. Bathroom facilities are shared with bedroom three and have a bath with shower and double vanity sink. Bedroom Five – (upstairs) with its greens and blue setting reflecting the ocean. This twin bedroom (double and single beds) is a great room for family or friends with a younger child to share, or just three children that don’t want to be separated! Bathroom facilities are shared with bedroom six and feature a walk-in shower and double vanity sink. Bedroom Six – (upstairs) with is our ‘signature room’ with its Mickey Mouse theme. Artwork and bedding celebrate Mickey and make this room perfect for friends or siblings to share and have fun. The room is a twin, with a single over the double, providing plenty of floor space to play on. Bathroom facilities are shared with bedroom five and feature a walk-in shower and double vanity sink. The Loft Area is an amazing space for your guests to chill and relax, with a huge corner sofa and 70inch flat screen TV. Grab a movie, watch a game or just chill. This is the perfect place for all members of your group to unwind and relax. Even the photos don’t show the real size. When we say an amazing space, this is an amazing space.